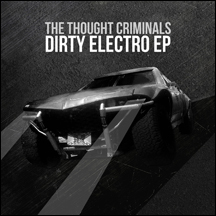 The Thought Criminals have returned with a new EP, Dirty Electro. The Thought Criminals was formed in South London, UK in 2004 when programmer/musician Kirlian Blue and vocalist/frontman Rocky Goode, set out to form a band that would blend early 80's dark electronic music with the more modern alternative dance music of today. Their style is really a hybrid of many electronic genre's and this new release takes on some heavier elements, but maintains the tongue in cheek lyrics that made them famous on their debut.